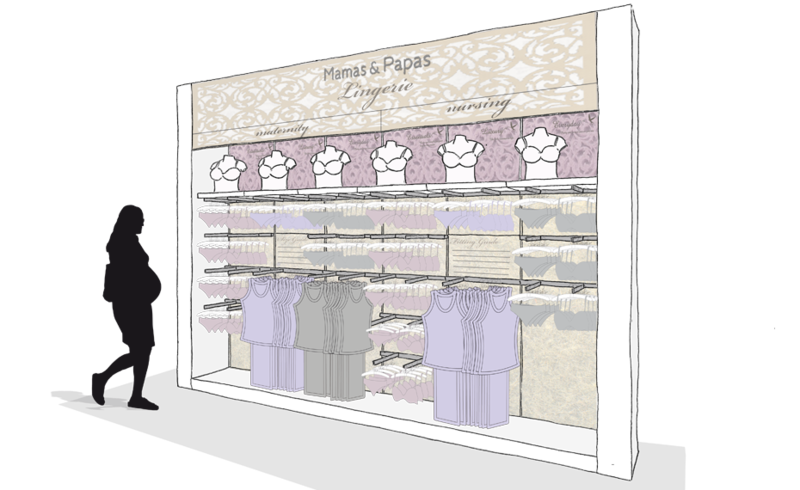 A new look and feel for Mamas & Papas’ new lingerie range, designed to give high visibility while remaining in keeping with the existing store concept. On behalf of Logistik Ltd, an elegant, boudoir design was developed, which connected to the existing brand personality and store design principles, while allowing the new product range to stand out. Providing a solution that could be deployed across perimeter wall bays, mid-floor gondolas and fitting room and window display cameo units. Using a range of luxurious materials, neutral tones and layered textures, resulting in the creation of a soft and sophisticated design that provided the perfect backdrop to the new product range.